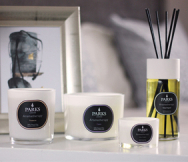 Parks Candles’ massage candle jugs offer a unique combination of aromatherapy-grade scents, professional quality massage oil and an unmatched experience when they are combined. The first thing you’ll notice when lighting this high-quality candle is the delicate scent combination that we simply call ‘indulge’. It is composed of many individual elements, but the most important are the scents of ylang ylang flowers, patchouli and palmarosa. This combination is heady, delicious, and just what is needed to put you in a thoroughly indulgent mood. Ylang ylang offers a piquant, almost tart floral note, followed by a rich, heady full-bodied conclusion. It is a particularly difficult scent to capture naturally, with many thousands of flowers being used to produce a few mere grams of pure scent. Nonetheless, you’re here to indulge! Patchouli is instantly recognisable as a rich, joyful scent that speaks of exotic locales and sensual adventures. It rounds out the ylang ylang’s tartness with mellow spice and creates something entirely new. Palmarosa is derived from a grass that grows wild between Bombay and the Himalayas. It is closely related to lemongrass, and has a similar scent that is, at the same time subtler and more powerful, with a rose-like edge that gives the plant its name. These exotic scents have been carefully bound in an all-natural wax that has been mixed with almond oil and cocoa butter, before being enriched with natural vitamin E so that it melts at very low (and safe) temperatures. It also moisturises and fortifies the skin when used. Once the flame has melted the oil and the scent has set the scene, your sensual journey can really begin.